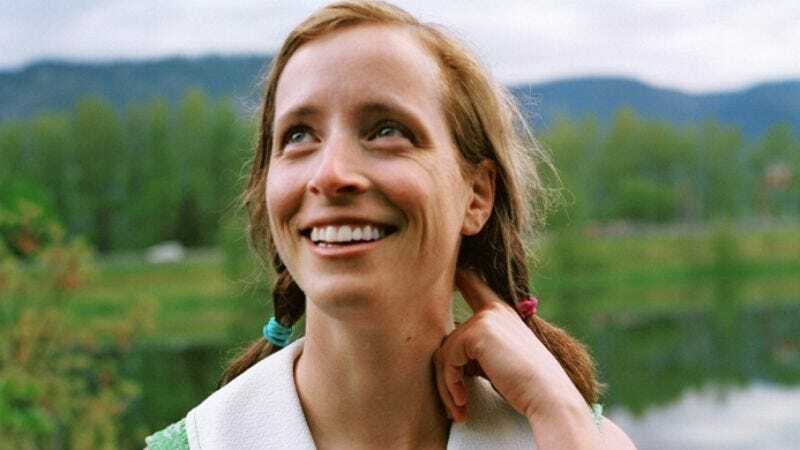 More than a decade into her career, singer-songwriter Laura Veirs is just now arriving with her seventh studio album, July Flame, which debuted at No. 1 on Billboard’s Heatseekers and Folk charts. After transitioning from Nonesuch Records in 2009, Veirs produced the self-released Flame in the living room of the Portland home she shares with longtime producer and partner Tucker Martine, bringing in My Morning Jacket’s Jim James (as well as other longtime collaborators) to flesh out her homegrown recipe. The result is a collection of hushed odes to the sweltering haziness of summertime—a theme reinforced by the record’s title, which gets its name from a particularly juicy variety of peach Veirs found at a local farmers market. Before her appearance tonight at the Larimer Lounge, Veirs spoke to The A.V. Club about her love of “improv quilting,” making musically inclined babies, and how to keep domestic squabbles at bay when your lover is also your producer. The A.V. Club: Not only are you well into your tour, but you’re also a few months pregnant. How’s that going? Laura Veirs: I’m due in two months, so I’m pretty big now. And it’s going well. I’ve already toured for three months pregnant. I did the first, second, and third trimester touring, and this is the easiest one. I can’t get up and down as quickly as I used to be able to, but I’m just a bit tired. AVC: This seems like a smart way to introduce your baby to your music. LV: I read a little bit about that, actually. There’s this professional classical player that was pregnant and practicing this really difficult passage over and over again on piano. After she had the baby, when she would play that passage, he would look up and recognize it. I think they actually know that the babies learn the patterns, because they can hear a lot from in there. AVC: July Flame has only been out a short while, but have you felt a difference in the response as compared to previous albums? LV: It’s felt even better than any other time, to be honest. It’s really gratifying, because it took me a lot of time to figure out the “best” way to release it. I was transitioning away from Nonesuch, and not sure whether I should try for a similar label or an indie label or start my own in earnest. Eventually my friend Chad put his name in the hat and was like, “I’ll run your label,” and it was clear that he was the one to go with. Because we’re running it ourselves, it feels even more satisfying that people are reacting well to Flame. It feels very homegrown. We recorded it in the living room and then mixed it in the basement. And Chad, who lives a block away, is running the label, and the warehouse is five blocks away where all the CDs are. It’s just very self-contained and feels like a neighborhood business, versus where I was before. I loved Nonesuch. They were great, and they didn’t meddle with the creativity part at all—which is rare. But at the same time, they were a giant corporation. So to have it very contained within my friends and family, it’s been really nice. AVC: How did you end up working with Jim James? LV: Tucker met Jim while working on the last Decemberists record. Jim sang on that, and they became friends, and then Tucker just asked him out of the blue, “Do you want to come sing?” because he was in town. He just came over to the living room and did all that great singing. He’s so talented with his voice. To have people so skilled with their instrument playing in our living room is a really special thing. It’s a really remarkable voice—a timeless voice that could be from any era. AVC: You often get pegged as writing music with very naturalistic themes and images, as on Saltbreakers and Carbon Glacier. Is that something you deliberately try to adhere to? LV: I don’t intentionally—well, yes, I have very much intentionally done that in the past. [Laughs.] But with this new record, I just wanted to see what came out, and not go in with a theme. It ended up taking longer, because I had to let my subconscious go to work and just discover over many, many songs what was really going on inside, instead of starting with a rational plan. It took longer, but maybe that paid off in the end. Once I saw a pattern in the lyrics, I started to use that pattern to my advantage to not feel like I had this blank slate of nothingness. There was a framework emerging, and I think that helps with any art—so you’re not just starting from scratch every day. AVC: On your website, you were holding a video contest for the song “I Can See Your Tracks.” Part of the prize is a hand-sewn thank-you note. Are you a big arts-and-crafts person? LV: Oh yeah. I’m a big sewer. I made a full-size quilt—but I didn’t hand-quilt it. I went to this really awesome workshop called “Improv Quilting” in Connecticut about two years ago, by Denyse Schmidt who went to [Rhode Island School Of Design]. I’ve made a few baby quilts that way, and I made a bunch of pillows, curtains, and a few other quilts. Sewing is the thing I like to do when I’m home. I used to be a knitter, but it made me feel neurotic. I couldn’t stop. AVC: You’ve been working with your producer—and romantic partner—Tucker Martine for six albums now. How does your relationship affect the recording process—or does it? LV: Because we started off as friends and creative collaborators, we set up this kind of relationship that’s professional. I feel like recording with him is something we’ve done for so many years that’s just really fun. For the most part, we don’t get impatient with each other because we are romantic partners. We actually made a pact not to do that on July Flame, because we knew the potential was there. So if someone did start to get snippy, the other would just say “pact,” and the other one would straighten up. Mostly, it was totally enjoyable, because we don’t get a lot of creative, concentrated time together, generally. He’s busy producing, and I’m busy touring and writing. So for us to have that three months last year, it was really fun.